Our first website was launched in 2007. We redesigned and relaunched it eight years later, on March 1st, 2015--the same day that we revealed our new brand identity, My Lowertown | My BasseVille. For people who want backgrounders and insights, we publish in-depth articles and essays in the bi-monthly Lowertown Echo community newspaper. 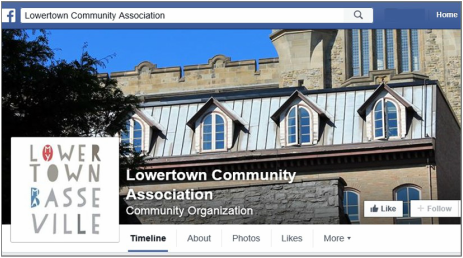 We cover topics such as the history of Lowertown, local businesses and personalities, and, planning and heritage issues. See the Echo page for more details and an archive of past issues. Every month, an email newsletter is delivered electronically to 600+ residents who have asked to be on our mailing list. It contains information about our monthly meetings, including Notes from the last meeting and an Agenda for the upcoming meeting. Occasionally, we send out special-edition newsletters about ‘hot-button' issues, development plans, special events, emergency meetings or other urgent matters. If you want to sign up for our newsletter, complete the form on our Blog page. The LCA takes a measured approach with publicity, limiting itself to issuing timely and relevant news releases about issues we are championing. As a result, we have garnered a fair share of coverage in the local media over the past few years. 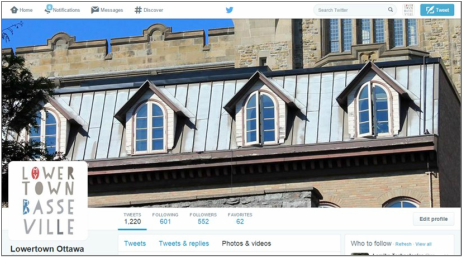 ​Follow us on Twitter for trending news, real-time alerts, on-site photos and status reports, re-tweets from city news-makers, and much more.